Checking your bank account the day after a night out can be torture. You cover your eyes and take a little peek — as if watching a horror movie — terrified of the damage one night may have done to your balance. Dinner, dancing and other common activities can cost an arm and a leg. Instead, next time you’re planning a night out with your friends or that special someone, try one of these free date nights or group outings. Free comedy shows often have bills full of up-and-coming comedians. You might have the opportunity to catch a stand-up just before he or she makes the big time. Even better, sometimes established comedians use random comedy shows to test out new material. I once saw well-known British comedian Imran Yusuf perform at a free comedy night at East London’s Comedy Cafe. Most comedy clubs have free entertainment on a random day of the week, like Sunday or Tuesday, and save the big names for Friday and Saturday nights. If you’re in a big city, you’re much more likely to find free comedy shows. Entrance to the “cool” clubs is pricy. However, not all clubs have a cover charge. 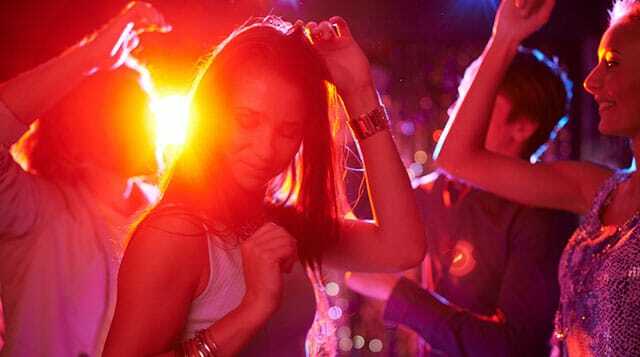 Seek out smaller, even quirky, places where you don’t have to pay to get in and can still dance the night away. Some clubs have a girls-get-in-free policy (sorry, guys); you could always split the discount among your group’s members. In college, my friends and I attended a “ladies’ night” at a fancy club and got hooked up with a free bottle of vodka! You can search for free club nights on TimeOut. Select your city and then choose “free” under the search filters. New restaurants sometimes host special evenings where you can sample the menu for free. They do this to get feedback on their new spot and lure in potential customers. You have to keep your ear to the ground if you want to fill up your stomach for free, and it pays to know somebody in the business. But, you can also find soon-to-be-open restaurants in your local area by keeping up with industry news on sites like Eater or TimeOut. Free music can be hit-or-miss: You might damage your eardrums, or you might find some amazing new artists for your iPod. To find free concerts, you need to know which bars in your city host live music. In most cities, you’ll find tons of websites with local gig listings through a simple Google search. There’s also this site that lists free gigs in New York City and Austin, with Chicago and Los Angeles listings coming soon. Open mic nights usually feature young hopefuls bringing their talents to the masses. Who knows — you could catch a glimpse of the next Taylor Swift before she’s famous! You’ll find open mic nights at the venues where you’ll find free gigs, as well as at coffee shops and other hipster bars. There are some great sites for finding free open mic nights, like this one with crowdsourced listings for the entire U.S.
You can often attend free open-air theater and performance art hosted by arts festival sponsors. Take the Oregon Shakespeare Festival, for example, which offers a ton of free outdoor shows six nights a week throughout the summer and fall. These are private galleries where guests have the potential to buy a piece, so don’t wander in off the street in your baggy jeans. Keep up to date with openings and exhibitions to see what’s happening in your area. Throughout the year, communities celebrate all sorts of occasions, and you can find ways to take part in the fun for free. For example, gaze in awe at a fireworks display on Independence Day or stroll around the markets at Christmas. Similarly, you can attend other free annual events, such as your local Mardi Gras or Pride parades. Going to the cinema is a great night out, but it’s become increasingly expensive. Here’s how to watch movies for free (and legally). In addition, attend festivals, arts centers and colleges where up-and-coming filmmakers premiere their work for free. If you’re looking for something romantic to do, find a free open-air cinema like the Skyway Outdoor Cinema in Seattle — you can cuddle up when it gets chillier in the evening. There are also lots of opportunities to get free tickets for advance movie screenings. You can hang out on the couch and watch the game, but there’s nothing like seeing an action-packed face-off live. Watch your local Pro-Am or minor league teams for free; all you need to do is find the schedule online. For example, here’s the calendar for the local pro-am basketball teams in San Francisco. You could also relive your youth by cheering on one of your local high school teams. Pick your favorite mascot, or simply root for the underdog. Kelly O’Hara learned a lot about frugal living from her penny-pinching family members, her bargain-hunter of a mother in particular. She experienced the need to cut costs during her time as a student and hasn’t stopped trying to make savings ever since, anywhere she can.